Don’t forget that today is is National Pancake Day! 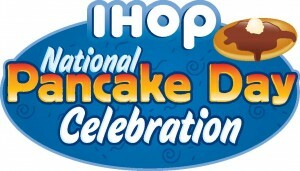 This means you can get FREE pancakes at IHOP. From 7am to 10pm, you can get a shortstack (3) of FREE pancakes. This is a great way to feed your family for cheap! If you do this deal, IHOP is also accepting donations to the Children’s Miracle Network or any other charity. I highly encourage you to give generously as you are able. Please note there is a limit of one FREE shortstack per customer.